“It’s always nice to be recognized for your hard work,” said Jeffrey Day, one of four Warwick Valley High School seniors recognized as Commended Students by the 2018 National Merit Scholarship Program. Jeffrey Day, Jacob Gaydos, Ryan Pfingst, and Jack Schenkman were recognized for exceptional academic promise demonstrated by their outstanding performance on the preliminary SAT/National Merit Scholarship Qualifying Test, last October. Over 1.6 million students took the test and entered the program. Warwick’s honorees were among 50,000 students with the highest test scores. 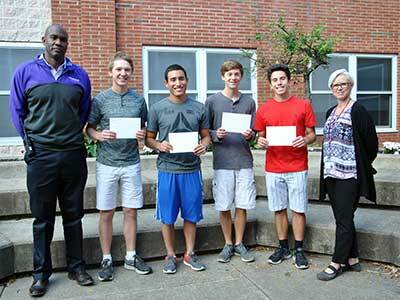 Jacob, Jeffrey, Ryan and Jack (L-R) received letters of commendation from Principal Dr. Washington. They were joined by School Counselor Mary Fox. “It feels good to do well and be acknowledged,” said Jacob Gaydos who is considering pre-med versus bio-chemistry, and Amherst College versus Swarthmore College. Jeffrey Day is also interested in pre-med studies and considering Cornell University. Equally appreciative and encouraged by the commendation were Ryan Pfingst who plans to study political science, and Jack Schenkman who has his eyes set on MIT to study computer science.